In whatever vague fantasies of sudden windfall/retirement I may have, one thing is consistent: A sunshine daydream, can’t stop, won’t stop diet of ceviche, poke, and chirashi bowls … and now Scarecrow’s calamari salad ($12).Whoever thought of this? I love you. Bits of beautifully charred octopus and calamari are tossed with ground, spicy chorizo sausage and plump, rehydrated raisins. The addition of a vinegar-coated frisée brings acid and balance to the rich melange of meats, while a decidedly flavorful and satisfying crunch comes from a handful of (be still my heart) chicharones. Unique and delightful, it’s one of the clearest examples of the ways in which Scarecrow’s wood-fired, open-flamed schtick really works. Set in a former train depot adjacent to the Children’s Museum of the Lowcountry, Scarecrow + Co. occupies a long and narrow building next to sister-restaurants Feathertop and Wise-Buck. Each with their own gimmick, the former is a more casual, veggie-driven option, while Wise-Buck (closed indefinitely) originally focused on smoked meats. Scarecrow, intended as the most sophisticated member of the trio, boasts a brick oven and an open-flame grill. The atmosphere is warmly upscale, but undermined by the “is it supposed to be this dark?” level of darkness. All around, the room is gently lit with the cool glow of cell phone screens as people strain to use their luminescence to see the menu. Or the food. Or the lips of their dining companion as, alas, thanks to the dark wood walls and high ceiling it’s simultaneously loud as hell. 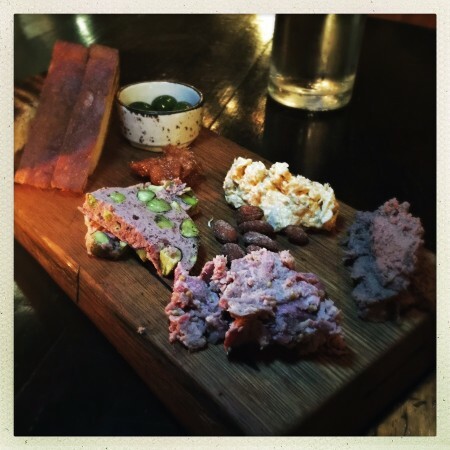 Perhaps borrowing from Wise-Buck’s original concept, the cured meat board ($11) showcases a level of skill worthy of pause. The kaleidoscope of locally-sourced, house-made wonderment threatens to make your head spin, but try to hold it together long enough to get some of the pistachio mortadella in your mouth. Rich and satisfying, the crunch of the nuts provide a pleasing contrast to the otherwise smooth pâté. Slightly less successful, the duck confit spread is notably unique and flavorful, yet overpowered by the sweet spices. In contrast, vinegar serves as a perfect foil to the inherent fishiness of the smoked mackerel mousse. Full-flavored, yet light, this is my idea of a perfect afternoon snack. The rabbit liver, however, is how I’d like to spend a three-day weekend. Rich and smooth, the red wine-infused preparation is decadent perfection, the star of an already impressive showing. 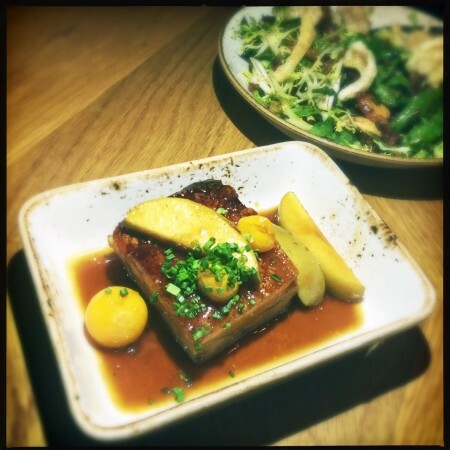 Rounding out the consistently satisfying starter options was the pork belly ($9). Admittedly, the first time around, the pork skin had achieved a military-grade toughness that couldn’t be stabbed, cut, or otherwise penetrated. Like a savory Jolly Rancher, it was a feat of science more than the kitchen. Nonetheless, served with gooseberries and vinegary, skin-on apples, there’s a nice balance of savory and sweet. This is probably why I was compelled to give the pork belly a second chance, and the latter preparation was succulent and tender. Still caramelized a bit more than necessary in spots, those with loose fillings should tread carefully. Otherwise, approach with abandon. On the entree-front, I began with the wood-fired meat section. The short rib ($32) came highly recommended, but the huge serving was tough and the fat not fully rendered. The accompanying bone marrow pushes things a little too Jack Sprat’s Wife greasy and the pickled onions simply aren’t up to the balancing act being asked of them. In contrast, the dry-aged duck breast ($29) is expertly prepared, the crispy skin a revelation. It’s the overly sweet farro and cherry mostarda accompaniment that fell short. An unwelcome distraction, the side dish is all cloying chewiness. Similarly perplexing is the mushroom ricotta manicotti ($17). The salty rolls of pasta are served on a bed of Southern-style collard greens loaded with apple cider vinegar. It’s an odd pairing, offering neither decadence nor subtlety. Vegetarians would do well to try the charred cauliflower ($9) instead. Imbued with the flavors of smoked wood and sweetened by the welcome crunch of almonds, it’s a fresh take on a ho-hum vegetable. The parsnip gratin ($9) is less approachable. More puree than anything, there’s not quite enough Parmesan cheese to temper the winter root’s sharp bite. In their red plaid shirts and blue jeans, the waitstaff is presumably dressed to resemble scarecrows. Everyone on the floor is equally knowledgeable and service starts out vigilantly attentive. Shortly after the main courses arrive, however, expect to stand guard over your own crops as the scarecrows scatter to greener pastures. Fortunately the loneliness will fade fast, so long as you’re sitting with a plate of grilled king mackerel ($26). I know, I know. Mackerel? Yes, mackerel. Beautifully, brutally char-grilled, the flesh inside remained moist and meaty. Contrasted with a bright, fresh chimichurri sauce and rich, flavorful mushrooms, it’s a lovely, luxuriant dish worthy of a cult following. Yes, you may languish in the noisy darkness for upwards of 35 minutes without another waiter/scarecrow sighting, but with a table filled with octopus, pork belly, and mackerel — not to mention the sinful delights of the meat board — what on wood-fired land or sea is there to complain about?